On average, there are 236 sunny days per year. The July high is around 92 °F (33 °C). The January low is 46. The comfort index, which is based on humidity during the hot months, is a 28 out of 100, where higher is more comfortable. Clermont was founded in 1884 and named for the French birthplace of A.F. Wrotniski, manager of the Clermont Improvement Company, formed for land development. The city was incorporated in 1916. Much of the county was first developed as orange and other citrus groves, which was the basis of the economy through the mid-20th century. For instance, Apshawa Groves owned and worked large expanses of land in the county. It later adapted as a major real estate company. Tourism also became increasingly important. The population grew 207% from 2000 to 2010, with commensurate economic growth, attracting big box retail stores. In spring 2010, the Clermont Landings shopping center opened, featuring 20 shops and restaurants and the city's first cinema. Increased pollution from runoff and residential development has hurt the city's lakes and other natural resources. In the city, the population was distributed with 20.1% under the age of 18, 6.3% from 18 to 24, 24.0% from 25 to 44, 24.7% from 45 to 64, and 24.8% who were 65 years of age or older. The median age was 45 years. For every 100 females, there were 89.9 males. For every 100 females age 18 and over, there were 85.5 males. In 2017, 89.6% of the population identified with a religion. 27.7% were Baptist, 3.1% were Catholic, Methodist 3.6%, Pentecostal 2.4%, Presbyterian 2.1%, Lutheran 1.4%, Other Christian 78.1%, Jews 1%. The median income for a household in the city was $39,290, and the median income for a family was $48,216. Males had a median income of $36,240 versus $26,571 for females. The per capita income for the city was $21,099. About 6.3% of families and 7.8% of the population were below the poverty line, including 15.0% of those under age 18 and 4.5% of those age 65 or over. The income per capita is $24,952, which includes all adults and children. The median household income is $45,980. The median home value in town is $227,510. Home appreciation was -21.40% during 2009. Renters made up 23.21% of the population. 8.33% of houses and apartments were unoccupied (vacancy rate). The Clermont sales tax rate is 7.00%. Local schools include Minneola Elementary School, South Lake Charter Elementary (also known as Imagine Schools at South Lake), Cypress Ridge Elementary School, Lost Lake Elementary, Clermont Elementary School, Clermont Middle School, Windy Hill Middle School, East Ridge Middle School, Lake Minneola High School, East Ridge High School, South Lake High School, Sawgrass Bay Elementary, Pine Ridge Elementary, Real life Christian Academy, and Grassy Lake Elementary. Lake-Sumter State College and the University of Central Florida have a joint-use campus in Clermont. South Lake Hospital is the regional hospital of south Lake County. The United States Triathlon National Training Center is located in Clermont. Duathlons, Triathlons and cross country races are held at the facility. Dale Barnstable, retired professional basketball player. Kate DiCamillo, author of children's books. Ryan Dungey, professional motocross racer. Shane Greene, professional baseball player. Marvin Musquin (born December 30, 1989 in La Reole, France) is a French professional motocross racer. Randy Pedersen, professional bowler on the PBA Tour, PBA Hall of Famer and bowling announcer. ^ "USGS Map Name: Clermont East, FL Map MRC: 28081E6 Map Center: N28.55625° W81.71832° Datum: NAD83 Zoom: 4m/pixel". United States Geological Survey. ^ "Population Estimates" (CSV). 2008 Population Estimates. United States Census Bureau. July 1, 2009. Retrieved July 24, 2009. ^ "The Citrus Tower". 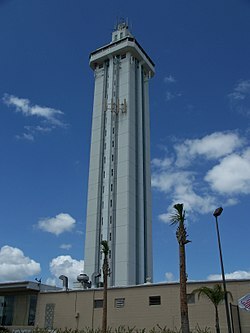 The Citrus Tower. Retrieved 2012-01-26. ^ "Clermont Chain of Lakes – South Lake County's Pride - Outside of Orlando". ^ "Clermont, Florida Facts for Kids". kids.kiddle.co. Retrieved 2019-02-01. ^ "Climatological Information for Clermont, Florida", USA.com, 2003. Web: . ^ Morris, Allen (1995). Florida Place Names. p. 52. ISBN 978 1 56164 084 3. ^ Herzensberg, Kirsten (2011). Edging the cities. p. 102. ^ "Algae a threat to health of Clermont lakes". ^ Dickinson, Joy Wallace. "'Winn-Dixie' author returns to Florida roots in new tale". OrlandoSentinel.com. Retrieved 2017-02-13. Wikimedia Commons has media related to Clermont, Florida.